This range of bulbs provides the ideal spot light for day time basking. Our Neodymium light bulbs simulate the full spectrum of sunlight. They give a clear crisp white light that closely imitates the sun more than any other type of incandescent bulb. Research indicates that animals benefit psychologically from this colour spectrum due to it's similarity to the sun. 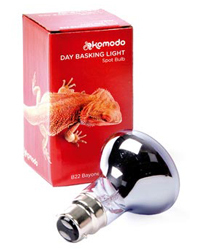 Komodo Neodymium Bulbs produce less glare, making a more comfortable environment for animals.